WEST HOLLYWOOD, CA- Last year, Enter Shikari released their fifth studio album, “The Spark”. It was a little bit of a departure from the “electronicore, stadium-scream” that they’ve become known for, but it was also an album that gave their fans an opportunity to see them spread their wings both sonically and thematically. 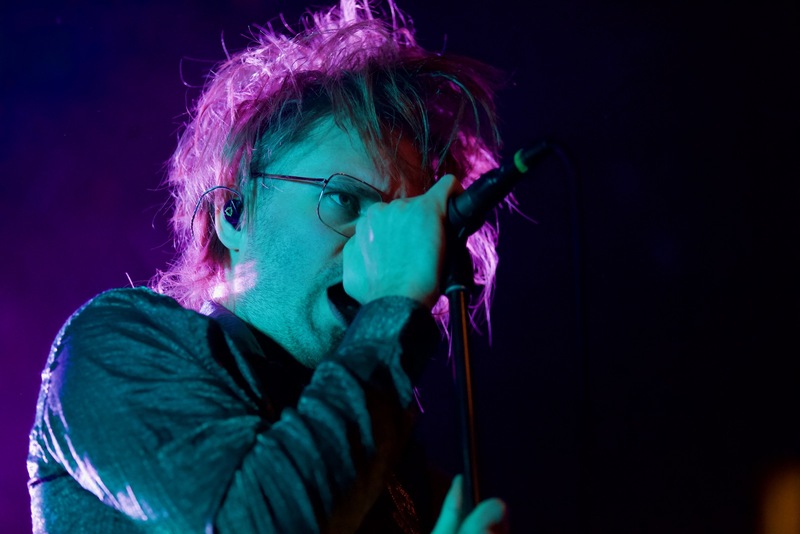 I had the opportunity to speak with Rou Reynolds (lead vocals, electronics) last year, and he was kind enough to answer some questions that I had about the album. The interview was never published due to poor digital administration due to a website redesign … coff coff … me (Please forgive me, Rou!). Rao: Yeah, well yeah, they have some sort of order. The track listing wasn’t done until quite late but there are a few things that helped make that sort of become apparent like how we wanted it to flow. The first thing that I wanted to sort of mimic, I suppose, with the ordering of the album was that a lot of the music I was writing at the start of this kind of album process was very positive and it sounded very upbeat very melodic, and I was sort of very perplexed by that because I was going through a lot in my personal life at that time, and also, some huge, sort of catastrophic and tumultuous things happening throughout the world during that period and most of my thoughts at least were quite negative, in terms of like, on a global and political scale. So the fact that I was writing all these upbeat positive tunes was really perplexing for me, I didn’t really know what was going on. But that became sort of a quite important part of the album then, you know, to find the positives through adversity. More often than not a period, sort of, of hardship or whatever is gonna make you come out stronger, more learned, more knowledgeable about yourself, or certain things in the wider world. You know, going through something and coming out as a new person. So yeah, it’s an important start the album in that sort of upbeat nature of the spark ethereal, euphoric intro… I just love those chords in that sequence. There’s something about it that breaks me and fixes me at the same time I suppose. And then “Live Outside” being the first track is very upbeat so we wanted to upbeat nature that sort of positive nature to be sort of apparent from the start, even though a lot of the lyrics are sort of dark and somber. Yeah, and then, you know, it’s a journey of emotions and finishes with we always wanted it to finish with the “Jigsaw Pieces.” And that was made even more sort of – I guess it was just a flash of serendipity really the key at the end of “An Ode to Lost Jigsaw Pieces” is the same key as “The Spark” and “The Embers.” But it was just like, wow, this was going to be perfect and then we’ll use “The Embers” as the outro. But there were a lot of moments that were just pure luck as well I think, in the ordering of the album. Enter Shikari @ El Rey Theatre 2/23/18. Photo by Derrick K. Lee, Esq. (@Methodman13) for www.BlurredCulture.com. Derrick: Now, I’m curious to know, well since we’re talking about start and finishes what was actually the first song you guys wrote for this album, or first song you actually recorded in the studio? Rou: That’s a good question. I’m not sure, I think “Live Outside” was certainly one of the first there’s about a sort of immediate rush of about five tracks … a kind of focused idea of what I wanted the album to be and sound like it’s quite different for us. Normally I would just write see what comes out, you know, sort of almost cobble something together in terms of an album. But this time the album was quite different especially in terms of the music. I had this sort of real focused kind of sound and atmosphere that I wanted on the album. Yeah, the writing process kind of excelled straightaway. And yeah, I think “Live Outside” was one of the first tracks. I think that it kind of has a lot of the things that I wanted this album to be, so, it has quite a broad vocal range, there’s a lot more of baritone lower vocals on this album which I’ve become more confident with over the last few years, and there are various influences that help me with that. And also a typical Shikari song is influenced by Drum-n-Bass and various forms of electronic dance music. It’s also influenced by like, post-punk. It has sort of interesting things about it like the bass guitar takes a lot of the main melodies and also sub melodies I suppose. Yeah, and it has that upbeat nature whilst actually the lyrics are very sort of sobering I suppose – they talk about mental health. So yeah, I think that was on the first songs that was a real sort of clear indication of what the album would be. Derrick: Did you write “An Ode to Lost Jigsaw Pieces” last, or .… How did, you know, that you had your nine tracks you wanted on the album? Rou: [I]t was probably when we started after all the demoing and everything we sat down with David Kosten who we co-produced the album with and sort of all together we tried to pick. I think we narrowed it down to about 15 tracks which, we recorded the bulk of things to all of those and then as we were recording we were sort of constantly trying to whittle it down to more. [It] become very apparent which ones would flow well and would fit on the album and would keep the album standing as, sort of, diverse as other Shikari albums would even though this one was far more melodic. I think “Airfield” was possibly one of the last ones that kind of became completed and suddenly lyrically and structurally. Yeah, I can remember those events that led up to the wire. Derrick: [Is] there any one song that you think that you may have more of a personal connection to or something that you think speaks more succinctly to your state of being in terms of the whole process of writing this album? Rou: Oh well I mean “An Ode to Lost Jigsaw Pieces” is certainly the most sort of personal track. Probably the most personal song we ever made – a song about loss basically in various forms for the first half or the first movement more pretentiously as they named it. It’s all about coming out of a long-term relationship and the sort of, the fear of being alone and al the anxiety that comes with that. And then the second half is all about losing grandparents. I lost my last two grandparents the year before – the same year I started writing the first few bits of this album. So yeah, that’s the most personal track on it. Derrick: [Y]ou keep repeating in the hook “I’ll wait this out, I’ll wait this out”. I had no idea that that song was written from such a personal place because the lyrics to me sound very optimistic[.] And at the very end with that song, it’s more hopeful and optimistic so I would have never gathered that you were writing in such a personal space when you’re talking about, you know, broken relationships or, you know, loved ones passing away. Rou: Yeah, well I think there always seems to have to be an element of positivity, and hope in everything that Shikari does, and even though when I’m speaking about some of the worst things […] there’s always that sort of fortitude I suppose and I guess the other line in “Jigsaw Pieces” is that we all cope somehow. I guess that line and the one you pointed out are all about trying to stay logical almost really and trying to come back to sort of the raw cutting emotions, you know, the sort of more classic knowledge of the time being a healer, and, you know, lyrics being able to help get you through things and make you a stronger person. Derrick: Besides the personal experiences, was there any major world events that—I’m sure there are a lot—are there any major world events that kind of influenced this album? I mean obviously, you know, with everything that’s going on in the UK, and everything that’s going on here in America, I’m sure you had a lot of source material, but was there a moment? Rou: Yeah, absolutely. I mean Brexit and also Donald Trump were two of the main influences, certainly for the track “Take My Country Back.” I think there’s a lot of that wanting to—essentially the album is wanting to overcome fears and the fears that come with unveiling human vulnerability and, you know, I think nationalism which is why really Donald Trump is in the position of the President of the United States and why Brexit has become a thing, and why the far right parties are in the right throughout Europe … I think nationalism is a philosophy … a mindset quite the fearful sort of kind of cowardly thing because, you know, if you think about it you’re sort of cowering back behind your sort of walls the walls of your castle if you like, and then you point outwards and you say everyone else is a foreigner instead of a human being. It’s just very strange sort of lonely sort of philosophy to have in terms of politics. So it’s really just going against that, and that’s why I wanted to not be afraid to show the more vulnerable side of our humanity and to speak these very personal things, because I think also the reason why you have people like Donald Trump in the world is because he’s being sort of forced at every point in his life, or told, demanded not to show any vulnerability, to sort of man up, to always be a man and not show any emotion, it’s sort of a very dangerous mindset to inject into someone, you know, if you look back at his life becomes very apparent at how that sort of mind that is affected. Usually those sort of repressed emotions just come out as anger and that’s when you get this sort of nasty people in charge that have these sort of excessive pride and it’s very nasty, it’s a very dangerous mindset. And so I think this album it was all about overcoming those fears of human vulnerability and not being afraid to show it. And I think that in itself is a very political move even though the songs on the album like “Take My Country Back” are very much so just more assertive, overt–overtly political tracks that are very literally about Brexit and that mindset. Also, I think the tracks that are more popular also by people are more political too. I was able to see Enter Shikari in concert when they were touring in support of “The Mindsweep”, so I knew what to expect. It was going to be a show would be a high energy and visceral experience with booming frenetic soundscapes and carefully crafted stage lighting. This performance matched my expectations. Rou and company unleashed their sonic barrage onto their loyal Los Angeles fans as their lighting danced and flashed around them. Watching Liam “Rory” Clewlow crowd walk was pretty damn impressive. Their performance was, however, effected by certain technical issues that caught my attention. Every so often, the sound completely dropped for a beat or two. Stage hands would race onto the stage to check whether plugs were securely locked in throughout the performance, but the the sonic blip occurred on several more instances. It didn’t really matter though, because whenever the sound from the stage dipped out, you could clearly hear the voices of the audience singing along in unison. That’s what I love about Enter Shikari shows. Their fans are seriously dedicated. Even before the band took the stage, the crowd chanted in unison the hook to the Enter Shikari song “Havoc”: “All this killing is obscene/Shut down the war machine”. That kind of communal moment sends shivers down the spine. The fans loyalty, however, would be tested towards the end of the show. As the band was performing their “Quick Fire” medley of songs (four songs in eight minutes which would have included “Sorry You’re Not A Winner”, “Sssnakepit”, “Meltdown” and “Antwerpen”), the hard drive of their session crashed. They tried to resolve the problem with a back up drive, but it was taking some time. As Rob Rolfe did his best to entertain the crowd, Rou reclined on some speakers waiting for the issues to be fixed. After about 10-15 minutes, and a lull of silence set in, fans refusing to leave started to chant the memorable line form the band’s self titled track: “And still we will be here, Standing like statues.” This continued for a moment before the band returned to the stage, expressed their sincere gratitude for us having stuck around, and announced that they would play a stripped down version of “Live Outside” to close the night, while wondering out loud about how they were going to finish the tour with both their hard drive and it’s back up on the fritz. After the song concluded, and those who stalwartly stood standing like statues during the lull made their way to towards the exit, it was evident that these fans, who were still humming the melody line to “Live Outside” while waiting for their Ubers and Lyfts, were completely satisfied. While their mood may have been different had this mishap occurred at the start of the show, it would take more than that little glitch cutting the set short a few minutes to dampen their spirits. Follow Enter Shikari on Facebook, Instagram and Twitter. Tuki Carter Celebrates The Anticipated Release Of “Flowers and Planes” In L.A. [NEWS] BC NEWS: TUKI CARTER AND "FLOWERS AND PLANES"